Our small herb farm is nestled in the Pioneer Valley of Western Massachusetts, we grow an ever diversifying variety of herbs using sustainable and certified organic practices on our land in Florence or are respectfully wild-harvested in our area’s fields, forests, hills and valleys. 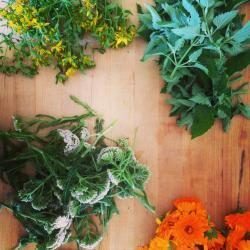 During the growing season we run a Fresh Herb CSA for the Valley, Boston, Worcester and New York City where we offer members an assortment of herbs from roots to shoots to leaves to flowers. We also grow nursery starts for the community. Year-round we offer tea blends, bulk dried herbs, culinary herb and spice blends, and a line of herbal extracts and body products. You can find our products and teas at farmstands, restaurants and grocery stores. We invite customers on to the farm to pick up orders. Please call or email ahead to arrange a pickup time. Our fresh herb shares are composed of a diverse assortment of fresh medicinal and culinary herbs ready for home use. From roots to shoots to leaves and flowers, we grow an ever diversifying variety of herbs using sustainable and certified organic practices on our land in Florence or are respectfully wild-harvested in our area’s fields, forests, hills and valleys.-Pickups are at our farm in Florence, or at various locations in the Pioneer Valley, Boston and Brooklyn. –We also offer an Apothecary Share, a monthly box of curated products made from our herbs that can be shipped to your door. For more information and to sign up, visit http://www.sawmillherbfarm.com/csa/.